Under the Affordable Care Act, small businesses (<50 employees) aren't required to offer health insurance, but most want to. And, there are new advantages of individual health insurance such as the premium tax credits and guaranteed-issue coverage. All of these factors leave small business owners looking to invest their health benefit dollars in individual health insurance reimbursement. The basic concept with individual health insurance reimbursement is just that - set up a formal health benefit program to reimburse employees for their individually-purchased health insurance premiums. This approach is taking off in America, especially with small and micro employers, and is often called employer-funded individual health insurance or a premium reimbursement program. To set up this type of reimbursement benefit, there are two core approaches an employer can take: a taxable stipend or a tax-free reimbursement plan. With this approach, the employer provides a taxable stipend or bonus to employees, with the idea that they will use the additional income on health insurance. This, however, can have mixed results. See: 4 Pitfalls of Increasing Wages for Health Insurance. With this approach, the employer utilizes Section 105 of the Internal Revenue Code to establish a formal self-insured medical reimbursement plan to reimburse employees for their substantiated individual health insurance costs on a pre-tax basis. This type of arrangement is referred to as a Healthcare Reimbursement Plan (HRP), and it must be structured to comply with applicable regulations including the Affordable Care Act's Market Reforms. Obviously, most employers (and employees) prefer a tax-free solution because of the added cost savings. The biggest benefit of individual health insurance reimbursement to the employer is cost control. The employer determines the amount to contribute to employees' healthcare, and unlike traditional employer-sponsored health insurance there are no minimum contribution amounts. Additionally, the employer is able to use the formal health benefits program to attract and retain key employees. This is huge for smaller employers who struggle to afford or qualify for traditional health insurance. For employees, the main benefits are the ability to use their reimbursement benefit on the plan of their choice, permanent and portable health insurance, and lower costs (especially for those employees who are eligible for the premium tax credits through the Health Insurance Marketplaces). FAQ: Can I Pay For Employees’ Insurance Premiums Directly? While it might be tempting to pay for employees' individual health insurance premiums directly, the answer is "no." Federal regulations prohibit employers from paying directly for employee's individual health insurance premiums, outside of a Section 105 Medical Reimbursement Plan (e.g. a Health Reimbursement Arrangement or Healthcare Reimbursement Plan), or other IRS/HIPAA/ERISA-qualified tax-free vehicle (e.g. Section 125). Read more about paying directly for employees' individual health insurance premiums. FAQ: What About the New ACA Rules on Individual Health Insurance Reimbursement? As of 2014, new Affordable Care Act regulations and requirements impact group health plans - including Section 105 Healthcare Reimbursement Plans. Specifically, as of January 1, 2014, all group health plans must be designed to comply with PHS Act 2711 (annual limit requirements) and 2713 (preventative care requirements). Employers looking to provide tax-free reimbursement should work with an experienced premium reimbursement software provider to set up a plan which complies with all applicable rules and regulations. 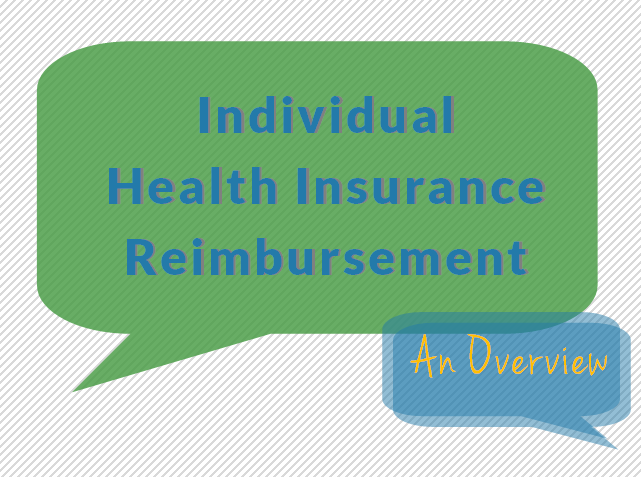 What questions do you have about individual health insurance reimbursement? Leave a comment below!